Alan Autry, on left, and Randall Franks review notes at Southern Tracks Studios 20 years ago while recording the “Christmas Time’s A Comin’” CD. It was just over 20 years ago that the stars of In the Heat of the Night stepped into the recording studio to raise their voices to assist charities that focused on drug abuse prevention. Show stars Alan Autry, “Bubba Skinner,” and Randall Franks, “Officer Randy Goode,” organized the effort under Autry-Franks Productions bringing together the cast and numerous stars of country, bluegrass and gospel music to assist. To mark the anniversary, the “Christmas Time’s A Comin’” CD is available again in association with original partner Sonlite Records, but this time exclusively through the non-profit Share America Foundation, Inc. continuing the original purpose denoted by the cast and music stars. “This project was a labor of love for us back then and Alan and I discussed earlier this year that we needed to share it once again with the millions of Heat fans who still watch us everyday and may have missed it the first time around,” Mr. Franks said. Mr. Franks, who lives in Ringgold, was the studio producer on the eight-month long production that included over 60 performers, visited seven studios in four states, included 12 recording engineers and took over 175 studio hours to complete. “Christmas is a time for family and as we look back now, we notice that there are a few vacant chairs left by our Heat family and those entertainers that supported this project, so it makes us cherish these recordings even that much more,” Mr. Franks said. "Christmas music is timeless and I know these recordings will touch hearts this Christmas and for many decades to come." The CD was originally released in association with Sonlite Records, Crimson Records and MGM/UA Television. Mr. Franks and Mr. Autry brought together several music stars that donated their performances. Among them Country Music Hall of Fame members Jimmy Dickens, Hargus “Pig” Robbins, the late Kitty Wells, the late Pee Wee King, and the late Grant Turner. Mr. Franks said one unique opportunity this time around is fans can also see never-before-seen original interviews and studio video about the project from cast members from the studios as special Internet features at Randall Franks TV on YouTube between now and Christmas. Locally in Northwest Georgia, monies raised from the project will benefit the Catoosa Prevention Initiative - Teen Maze 2013. Phil Ledbetter, Catoosa Family Collaborative coordinator, said that project encourages youth to make the right choices in many situations including with drugs and alcohol. "Our Catoosa Teen Maze is designed to allow young people the opportunity to explore life like situations and their consequences without having to suffer the real life permanency and pain," he said. 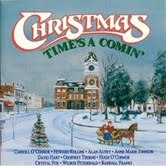 Christmas Time's A Comin' is available in Ringgold at Cottage Treasures, Kozy Boutique, Tillie Towne and Uniktings! and in Fort Oglethorpe at Tootie’s Treasures. It is also available online at www.shareamericafoundation.org or via mail for a donation of $20, inside the U.S. ,and $25, outside the U.S., to the Share America Foundation, Inc., P.O. Box 42, Tunnel Hill, Ga. 30755.